As online leadership development programs grow in popularity, L&D executives are tasked with comparing differing kinds of online programs with traditional, in-person experiences such as business school and company sponsored programs. To help you select the perfect solution for your organization’s strategic business needs, we’ve identified the most important attributes associated with successful learning initiatives, then compared online programs to in-person experiences. We found that high-quality online programs and traditional, in-person experiences can deliver exceptional training, but online programs are more agile, scalable, and are better situated to prove impact. High-quality, online programs are significantly more agile than traditional, in-person experiences. Given that business strategies change an average of five times in a three year period, L&D leaders are looking for agile solutions to keep up. Online programs enable L&D leaders to keep rapidly deliver skills to their leader that match strategic shifts. Traditional, in-person experiences are less agile. Often educators select program topics months in advance, relying on content that is many years old, without reviewing current business needs. Online leadership development programs are more scalable than in-person experiences in two significant ways. First, companies that utilize online programs can reach a larger and more diverse audience compared to in-person programs. Second, online programs are more economical. Organizations can send almost 6x the number of leaders through an ExecOnline program, compared to an in-person experiences at the same cost. In-person programs like those offered by universities are rigid. In most cases, participants must travel to a specific location for a 1- or 2-day event. Online programs enable participants to review content and complete assignments wherever and whenever they like. A critical benefit is that online programs keep executives at work, instead of removing them from their day-to-day duties. Regardless of the delivery method, it’s difficult to prove a program’s business and financial impact. In-person experiences can achieve high participant satisfaction and knowledge transfer rates, but often fail at measurable return on investment. Participants generate $179,000 in financial impact for their organization. Online programs are as engaging as in-person programs. Quality online programs, like those offered by ExecOnline, are designed to generate maximum participant engagement. One way we do this is by offering diverse content throughout a program such as short learning videos and live virtual sessions with peers. ExecOnline utilizes “asynchronous learning,” meaning participants can view our programs’ content when and how they like. This empowers leaders to move at their own pace, back up or fast forward through content, and repeat sections as often as they like. We found that 92% of ExecOnline alumni say the quality of material and faculty of our programs was equal to or better than in-person programs in which they previously participated. Additionally, 88% of our alumni report their motivation to complete an ExecOnline programs was equal to or better than their motivation to finish in-person programs. The completion rate of a program is dependent on a number of factors. Both in-person and quality online programs can achieve high completion rates. High-impact online programs achieve an 85% completion rate or higher. For example, ExecOnline’s completion rate is 92%. In-person and online programs are appropriate for middle and senior level executives. ExecOnline programs focus on the “critical middle,” which is comprised of Middle Managers and Senior Managers who make up the bulk of executives within every organization. 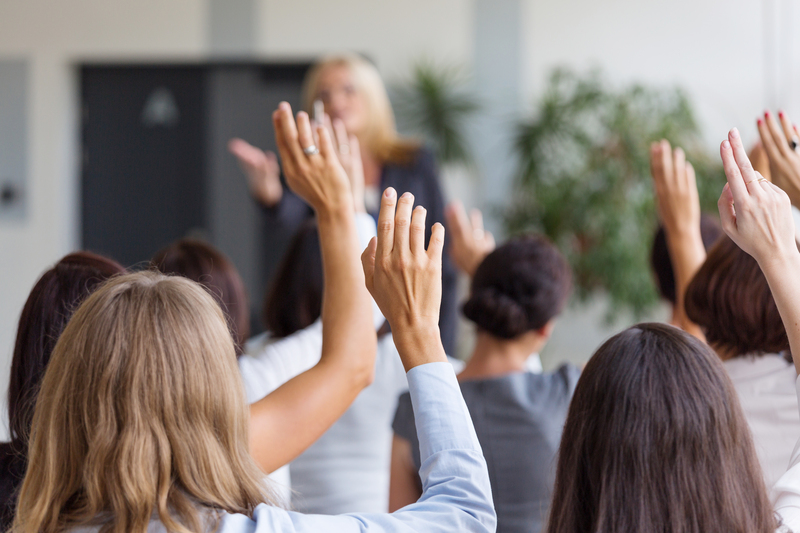 Top business school executive education programs typically offer certificates. 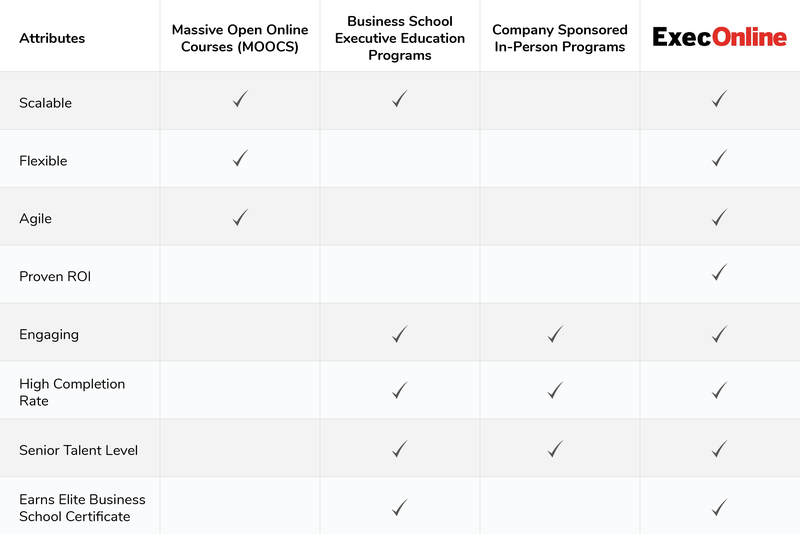 Its extremely rare for MOOCs and business sponsored experience to offer certificates from prestige business schools. Leaders who complete an ExecOnline program earn a certificate from one of our business school partners, which includes Berkeley, Columbia, IMD, MIT, Yale, and Wharton.